The technology of self cleaning coatings has developed rapidly in recent years. The use of self cleaning coatings is attractive as these are labour saving and effectively improve the appearance. The field of self cleaning coating is divided into two categories: (a) hydrophobic and (b) hydrophilic. Both these types of coatings clean themselves through the action of water, the former by rolling droplets and the latter by sheeting water that carries away dirt. Hydrophilic coatings, however, have an additional property that they can chemically breakdown absorbed dirt in sunlight and the process is known as‘photocatalysis’. Semiconductor nanoparticles as TiO2, ZnO α-Fe2O3, ZrO2, CdS, WO3 and SnO2 are successfully utilized in photocatalytic applications. Titanium dioxide (TiO2) belongs to the family of transition metal oxides. In recent years, crystallineTitania or Titanium dioxide (TiO2) has received much attention due to their interesting properties as photocatalyst. Among many semiconductor photocatalysts, there is a general consensus among researchers that TiO2 is more superior because of its high activity, large stability to light illumination, low price, and nontoxicity. 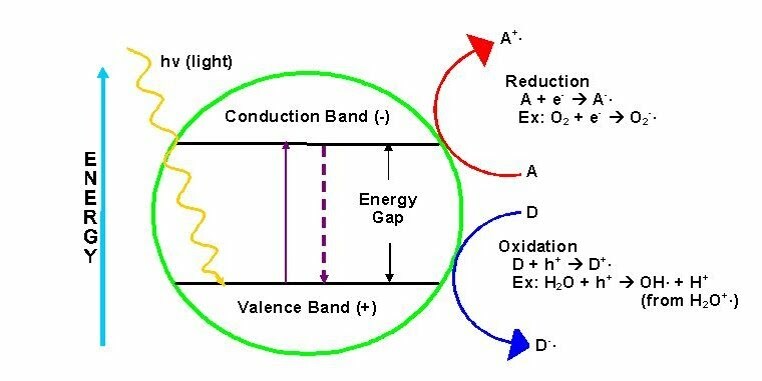 When a photocatalytic surface is illuminated by light with energy equal to or larger than the bandgap energy ΔEbg (bandgap energy of TiO2 is 3.03), it excites the electrons in the valance band to the conduction band, resulting in the formation of a positive hole (p+) in the valance band and an electron (e−) in the conduction band. The positive hole oxidizes either pollutants directly or water to produce HO˙ radicals, whereas the electron in the conduction band reduces oxygen adsorbed to photocatalyst (TiO2). The effect of various dispersion stabilization parameters on particle size, stability, and self-cleaning activity of titania aqueous dispersion was investigated with a focus on stability during preparation, storage, and introduction of fabric in the dispersion. Effect of parameters such as sonication, high-speed mixing, pH, and addition of ionic and nonionic dispersants was studied. The degree of surface charge on titania influences its stability and depends on the type of pH and dispersant. The stability of titania dispersion with the immersion of cotton, was also found to be a strong function of pH, dispersants and their combination. Nano- TiO2 coatings have been applied to cotton fabric by sol- gel process without any crosslinker or binder. The characteristics of coatings derived from two different approaches by Sol-gel process are compared. It is revealed from the Fourier transform infrared spectroscopy that the TiO2 Sol particles have the similar spectra as observed for commercial TiO2 (Degussa P25). The nano-TiO2 particles are applied to cotton fabric using 1 wt% acrylic binder and cured. The photo- catalytic activity of the finished fabric has been investigated and a comparison is made between the commercially available TiO2 sample and the nano-sol coated samples. The self-cleaning action of nano-crystalline TiO2 coated cotton has been quantified by measuring the photo-catalytic degradation of stain due to visible light irradiation. 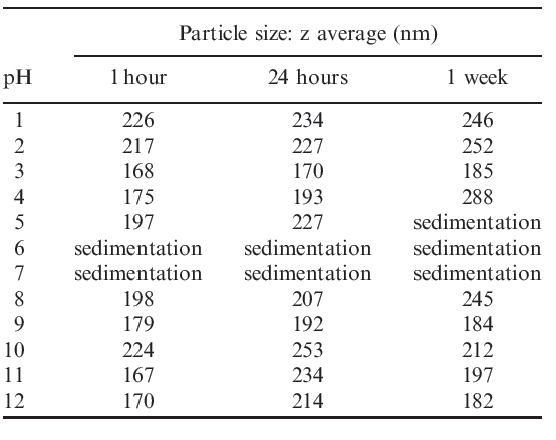 Nano-sol derived TiO2 particles with smaller particle size of <10 nm (prepared using nitric acid) show significantly better activity than the commercial TiO2 sample of the particle size 25nm. The titanium coatings on fabric also act as anti-bacterial photocatalyst.